The protesting continues and has escalated to being more deadly that Iran's Green Movement and now people are looting :( and some are guarding their heritage, such as with the incident at the National Museum, while asking for their rights. I am sad that things are not getting better and that violence is still playing a major role in this struggle. I have no idea why President Mubarak thinks that having a Vice President for the first time and a Prime Minister is going to sway public opinion. He is still at the top of the pyramid, which is where the people are calling for the most change! It also always amuses me when the international community put in their calls and pleas for this leader to step down or for justice. No matter what the West says, what will be done in Egypt will be done and quite frankly sometimes I think that their 2 cents actually hinders rather than helps the process. Due to the complicated and patronising relationship the West has with the rest of the world, it always seems that if people follow what they say, even if it is the right thing to do, then it causes accusations of puppetry and things. Sometimes it is just best to watch, however painful it may be, and let people sort out their problems and be proffer help when it is sought. For great background and ridiculously detailed and regular updates on what is going on in Egypt, take a look at this blog post on Mother Jones that is dedicated to keeping us up-to-date as developments arise. Thanks to DR JOURNO for letting me know about this and helping me on my quest to get up-to-speed on the Eygptian situation historically and presently. Here is a video with an update on how the army is responding. I am glad that the army officer says "Demonstrate and express yourselves, but at night clear the streets and let us handle the thugs." Many people are ignoring the curfews put in place which are for their own protection. The army is having difficulty distinguishing between the "good" and the "bad". I hope that other army units take this human approach on board to keep the protests safe. I also just want to touch on the fact that the regime shut down the internet two days ago when they realised that social media was part of the logistical tactics of the protesters. This is unacceptable. What I love about the internet is that it affords the average citizen the ability to express themselves in the public or private sphere at little cost. It enables those who are not activists an easy entry to participation in political matters. It provides low barriers to entry to protests. All they need to see is when and where and they can mobilise, they don't need to have pledged allegiance to the fight or have paid dues. 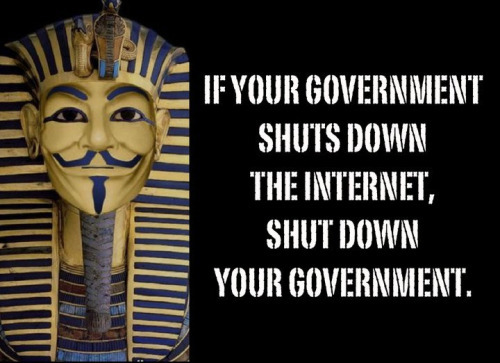 This media tumblr image says it all in the case of Egypt. "Tunisia is alive. Don't be afraid. We are not dead." So beautifully powerful a statement in its simplicity. Both Egypt and Tunisia are more alive to me that they ever were. I feel like North African states are portrayed as the "dead" parts of the Arab world in the media. They are the places you go holiday, places to find middle ground, but not the places that are really focused on as the axis of evil in the war on terror. I am glad that they are defining themselves in their own eyes so publicly and thus enlightening us. Secession is imminent. 99.57% voted for seperation and President Bashir has said he will acknowledge the results when they are officially announced next month. Great update post, and thanks for links especially to mother jones, a good one. What you said about the north african countries being seen as 'dead' in western media is very interesting. made me think also of how the truth always comes out even though the portrayal of arabs and north africans is militant islamists and non secular now they are in fact proving how progressive and politically conscious the region is.